Once before I almost sold this book, but changed my mind because I wasn't quite done being inspired by all these wonderful quilted flowers! But the time has come for it to find its next home and is available for purchase here. There are 27 projects for different items and most feature these dimensional flowers with Sashiko or hand quilting style stitching. All instructions are in Japanese, but are pretty straight forward. And as a side note, I was downtown a few days ago and saw that Kinokuniya is opening a book store downtown! For any Portlander on the east side who loves their book store (they have lots of these Japanese craft books) and stationery, this is fantastic news. I've been to Kinokuniya a few times, but since it's in Beaverton, I'm rarely interested in making the drive to the other side of the city. Happy Thursday! 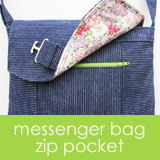 Today seems like a good day to show you these denim bags and also offer them as samples. Both of these are the same size, fabrics (denim and quilting cotton), and topstitching (red), but with different colorways of the lining fabric. They are being offered individually, but if you'd like them both and both are still available, feel free to make them yours! You'll just need to check out twice. One is sold out...thank you! 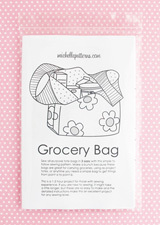 Oxford fabric, like this pink strawberry print, is one of my favorite fabrics for the Grocery Bags. After finishing making a large Grocery Bag from the one yard I purchased, some of what was left was put to use making this Basket Bag. 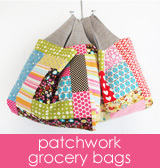 This bag is the dimensions of the black one in the post about the Basket Bag mod for the Grocery Bag pattern. The only difference is I folded the corners at 2.5" instead of 3". For some reason I wrote on my Basket Bag pattern piece to fold at 2.5", but the other ones I've made have been folded at 3". But the good news is it doesn't really matter! The bag ended up slightly taller and wider but still has the same functionality. There was also more fabric left over and the remnants are posted for sale right here. Yardage of this fabric can be found on here. This post has one affiliate link. I finished up these rolls of quilt binding and took the photos and then two sold (thank you!) before I was finished writing the blog post. But let's take a look at them anyway because we all like looking at fabric, and of the two that sold, I can make more of one of them.